Since we’re in the middle of Passover and warm weather is inching ever closer, I can think of no better time than to recount the story of my pilgrimage to Max & Mina’s Ice Cream at 71-26 Main Street in Kew Gardens Hills, Queens. That they’re kosher is beside the point – and their over-the-top decor showcasing covers from 60’s era Mad Magazines, cereal boxes, and other memorabilia against a seaside themed subplot is just the tip of the icecreamberg. It’s the seemingly infinite roster of unique, unusual flavors they’ve created over the years that’s their claim to fame. If you can name it, and even if you can’t, they’ve probably made it: Cotton Candy Pop Rocks, Pancake Chip, Sponge Bob, Circus, Snickers, Bourbon, Merlot, Coffee & Doughnuts, every breakfast cereal I can think of like Rice Krispies, Cap’n Crunch, Fruity Pebbles, Cocoa Puffs and Quisp. (Remember Quisp? I wonder if they did Quake.) If your taste runs to the more conventional, there’s always Mint Chip, Pumpkin, Nutty Pistachio, Peach, Rum Raisin, Key Lime Pie and the like. 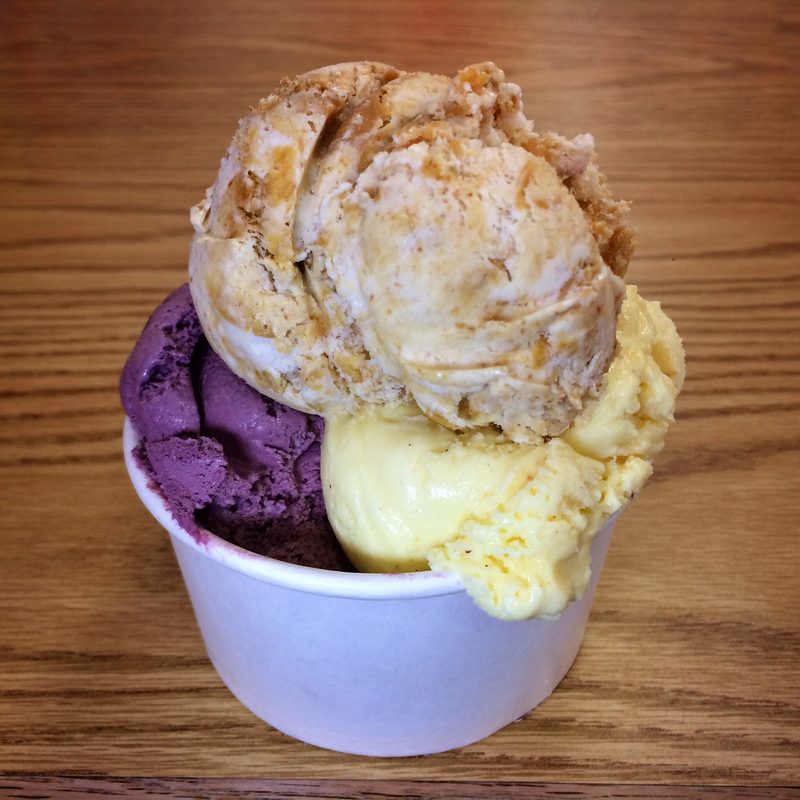 This trio comprises Peanut Butter Pie, Blackberry, and Egg Nog. I’d name more but Instagram limits me to 2200 characters. I’m told that they also have chocolate, strawberry, and vanilla. So how does Passover factor in? In a nod to Judaica, past flavors have included Nova Lox, Herring, Horseradish, Cholent (a Sabbath stew), Esrog (the yellow citron that’s part of the Jewish holiday Sukkot) and Macaroon. But not only plain macaroon, oh no. How about Chocolate Macaroon, Coffee Caramel Macaroon…the list goes on. Horseradish gets a similar facelift from strawberry and blackberry infused versions as well, and their Babka ice cream really takes the cake. Note that when you go (and it would be a shonde if you don’t), none of these flavors may be available, presumably to accommodate the latest experiments, but I can guarantee that they’ll be replaced by as many equally intriguing offerings in a rainbow of flavors, colors, and textures. So nu, what are you waiting for? Two notable celebrations of the season, Easter and Passover, are concomitant this year. It’s no coincidence that the Italian word for Easter (pasqua) and the Hebrew word for Passover (pesach) are closely related, although culinarily the holidays couldn’t be more disparate. During this time of year, Jewish families are expunging their homes of even the most minuscule crumb of anything leavened, and Italians are baking Easter breads like they’re going out of style. 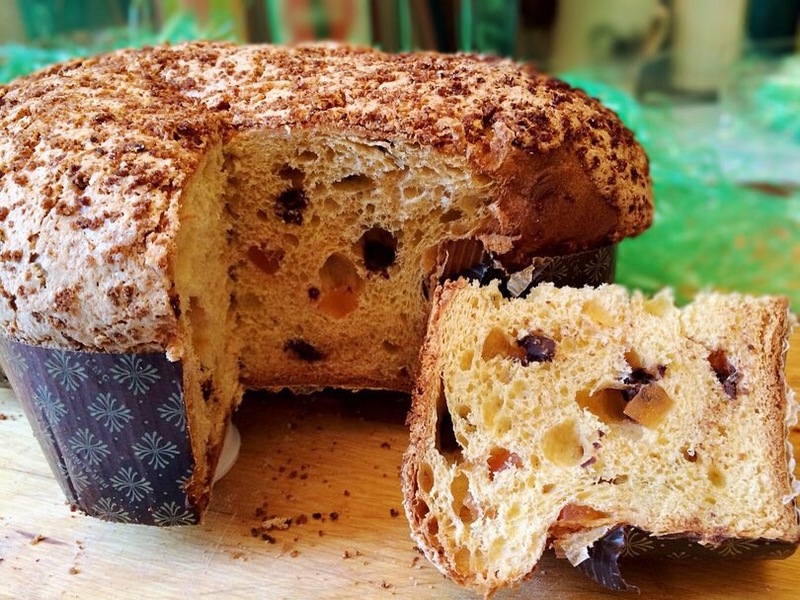 Italy’s traditional seasonal bread is La Colomba di Pasqua (“The Easter Dove”), and it is essentially Lombardy’s Eastertime answer to Milan’s Christmastime panettone. 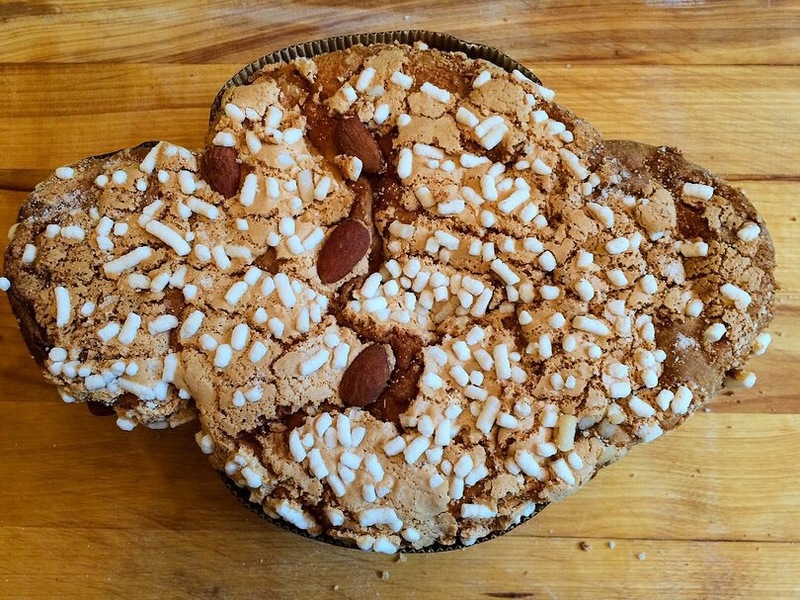 These deliciously sweet, cakey breads, in some ways Italy’s gift to coffeecake but so much better, are fundamentally the same except for two significant distinctions: the colomba is baked in the shape of the iconic dove that symbolizes both the resurrection and peace, and the recipes diverge with the colomba’s dense topping of almonds and crunchy pearl sugar glaze. Traditionally, a colomba lacks raisins, favoring only candied orange or citron peel, but as with panettone, fanciful flavors (including some with raisins) proliferate. Seems like no one can agree on the proper name for this confection but everyone agrees that by any name it’s noteworthy. 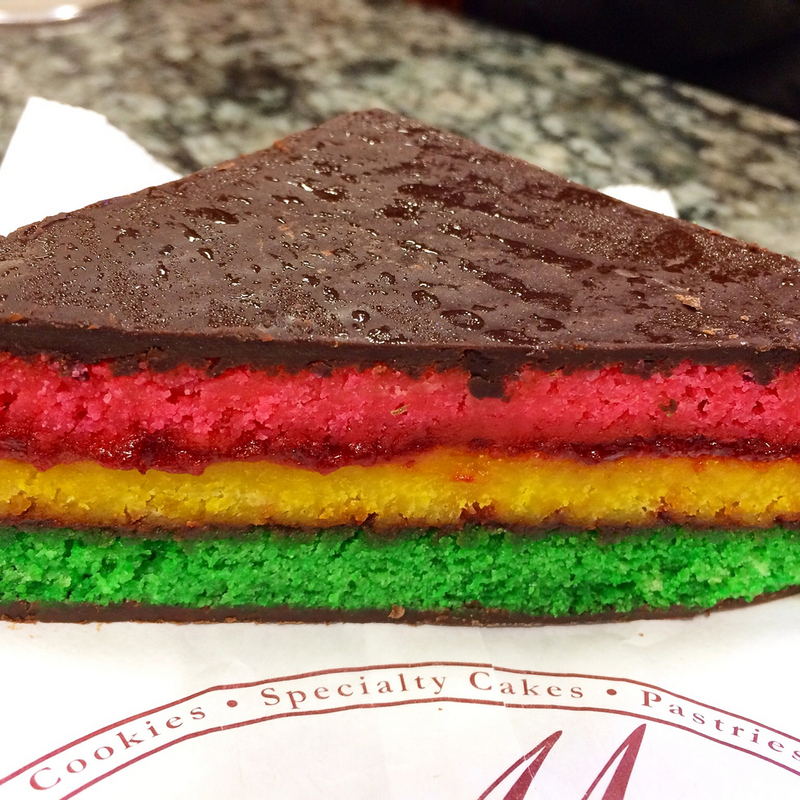 It’s the Italian rainbow, three color, tricolore, Neapolitan, Venetian, seven layer (chocolate + cake + jam + cake + jam + cake + chocolate) cookie/cake. And arguably, it’s neither cookie nor cake. It flies the colors of the Italian flag – except sometimes when yellow subs for white (a pennant sallow with age, perhaps?). Fillings range from apricot or raspberry jam or marzipan to cannoli crème (hard to find, but oh so rewarding when you do). This wedge hails from Morrone Pastry Shop at 2349 Arthur Ave in the Bronx, Belmont’s Little Italy – almost a little too sweet (is that possible?) but good nonetheless. 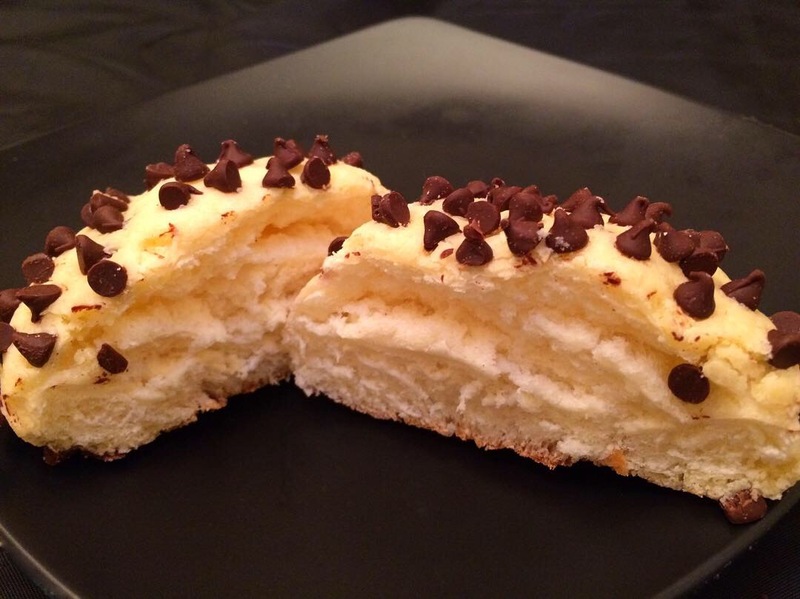 I’m considering working my way through the neighborhood to compare versions in a longstanding quest to equal the one with marzipan and cannoli crème I had last summer from a bakery in Staten Island that is now shuttered. Life is hard. 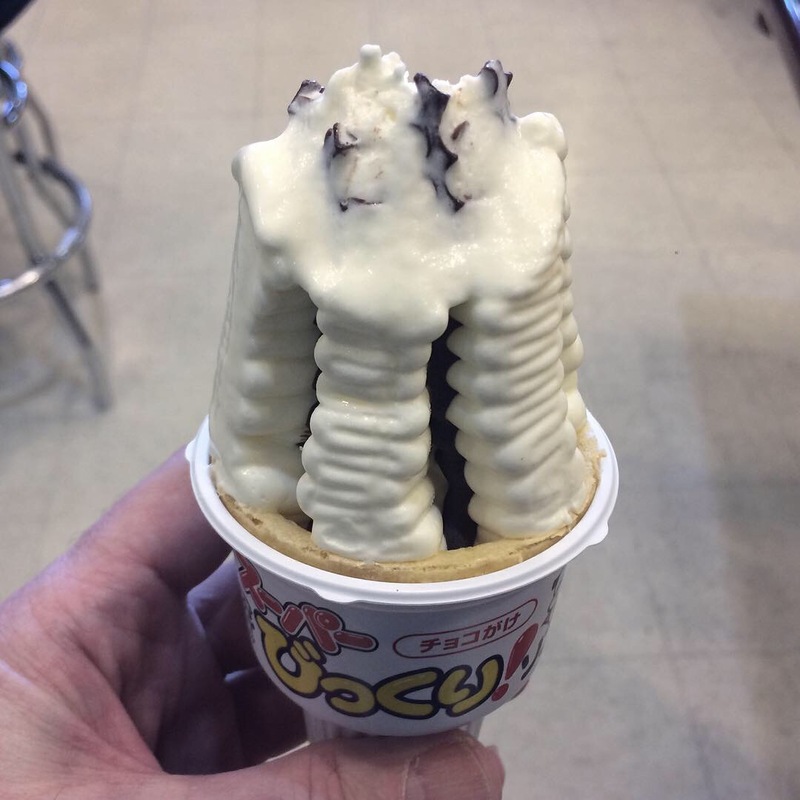 A recent visit to the frozen food aisle at Mitsuwa Marketplace, probably the most comprehensive exclusively Japanese supermarket in the area, turned up this besquiggled, choko-cliff of an ice cream cone that was too visually compelling to forego. 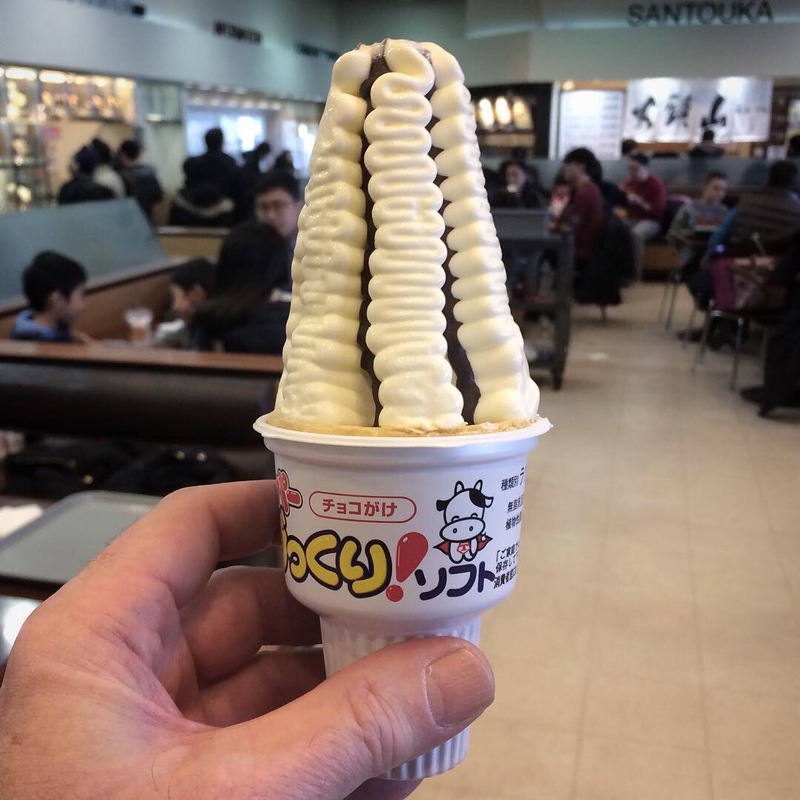 I made my way through the red balloon katakana (“super”), the yellow hiragana (bikkuri which means “amazed”), and the creamy soft-serve curlicue to be rewarded with a crunchy chocolate supporting infrastructure. The inside scoop (as it were). Truth in advertising: “amazed” pretty much summed it up. Mitsuwa Marketplace is located at 595 River Road, Edgewater, NJ. Another of my favorite neighborhoods for food exploration is Newark, New Jersey’s Ironbound District. Possibly named for the web of railroad tracks that surround the area or possibly because of its significant metalworking industry, it’s home to a large Portuguese and Brazilian population and, naturally, their cuisines. Since our primary destination was a Burkinabé restaurant in Newark (which I’ll post about soon) and the Ironbound lies at the foot of Newark Penn Station, it begged a quick side visit (is that even possible?) to Teixeira’s Bakery at 186 Ferry St.
 Portuguese pastries are multitudinous in diversity, eggy and delicious. 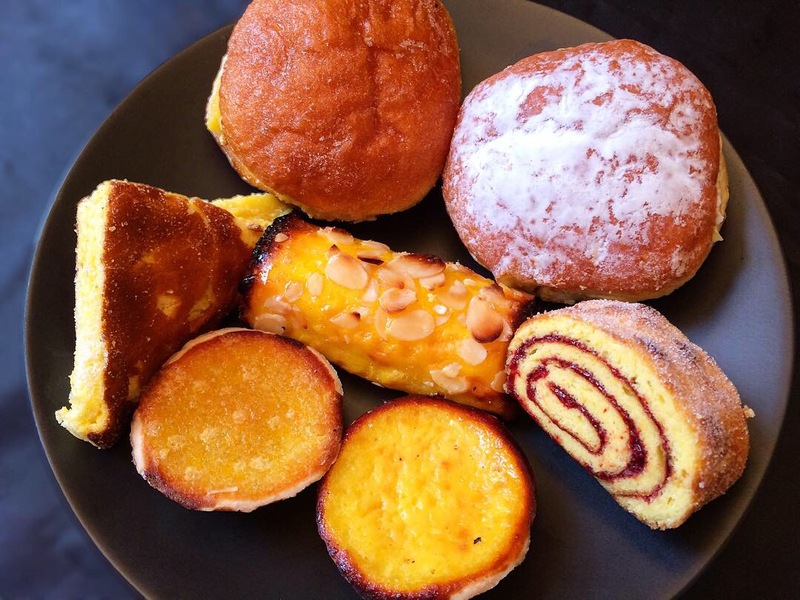 • Bolas de Berlim, also known as Berliners, are a sweet, filled, pillowy yeast donut. The doce de ovos filling is a typical Portuguese sweet egg custard that figures into many desserts; Teixeira’s also makes a vanilla custard (crème pâtissière) variety because, I was told by the delightful person behind the counter, “some people don’t like the egg”. IMHO, they don’t know what they’re missing. • Lencinho means handkerchief or napkin; a square of fragile Portuguese sponge cake – practically a thick pancake – is slathered with doce de ovos and folded into a triangle as a napkin might be; the least sweet of the lot. 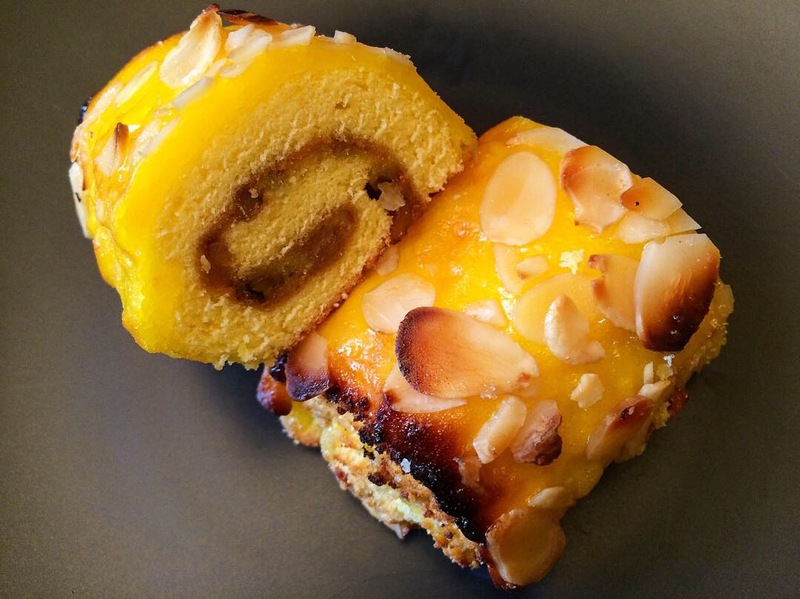 • Ferreirinhas start with a square of sponge cake spread with chopped almond filling (not almond paste), rolled up, and topped with more eggy goodness and sliced almonds. • Torta Morango, a slice of strawberry jellyroll, egg-rich and supple. • Queijada is a type of cheese cake, but not quite cheesecake, amêndoa (almond) and laranja (orange) shown here. The crusty, spare outer shell is rigid, the filling a little curd-like, too grainy to be considered a custard, but appealing nonetheless. 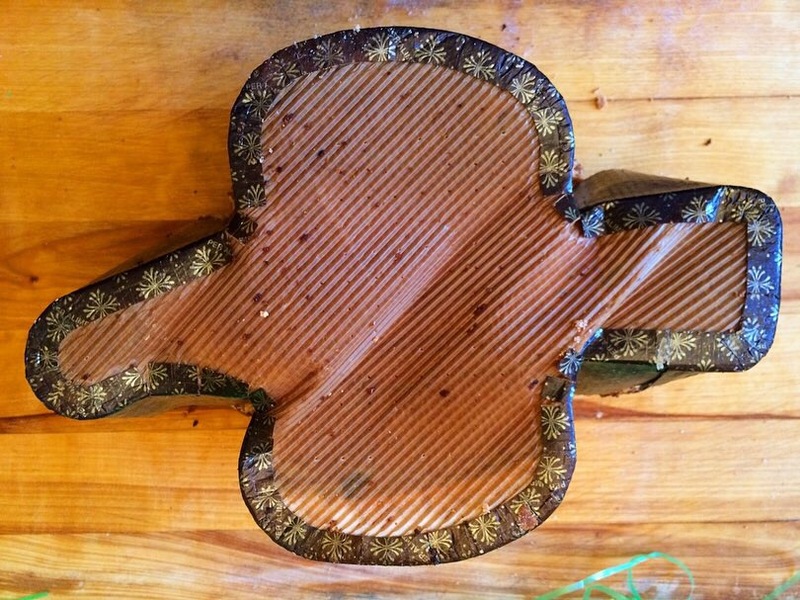 Inside a ferreirinha and a better view of its crispy edge. 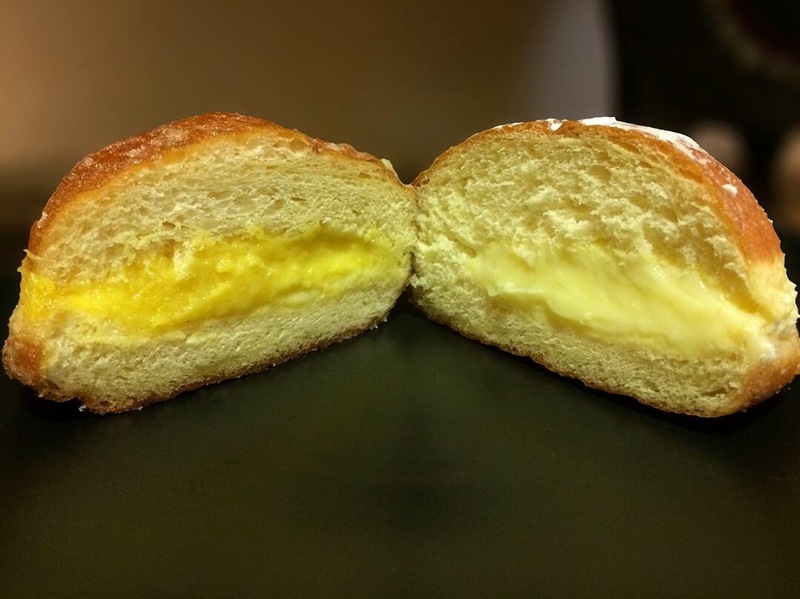 On the left, a bola de Berlim filled with doce de ovos, on the right its vanilla custard sibling. Compare and contrast. So much more to explore in the Ironbound District; I’m planning a return trip very soon when I can actually spend some time! Have I tempted you yet? The Equal Opportunity Celebrant strikes again, eating my way through Holi today, the Hindu festival of spring and colors celebrated predominantly in India and Nepal. Prowling around the Indian neighborhood in Jackson Heights yesterday in search of traditional Holi treats, I enjoyed watching children choosing packets of powder in every color of the rainbow to sparge at anything in their path, thus producing a glorious festive mess. The holiday recounts the heartwarming legend of Krishna coloring his face for Radha, his love, and heralds the arrival of spring. Jalebi are one of the most widely available Indian mithai (sweets); they’re made from chickpea or wheat flour batter, usually orange but occasionally yellow (no difference in flavor, just a color preference) which is drizzled into hot oil in coil shapes. The resulting deep fried confections look like pretzels; they’re crispy when they come out of the oil, then they’re soaked in super sweet syrup so you get the best of both worlds. 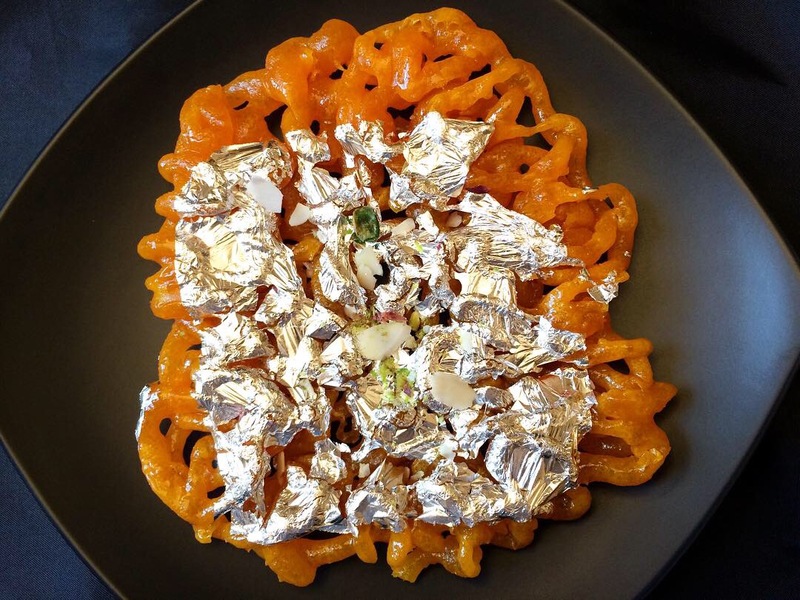 For Holi, however, jalebi get the royal treatment; this one is about 7 inches in diameter and generously adorned with edible silver foil, sliced almonds and pistachios. Because this sticky jumbo jalebi (jalumbi? jalembo?) is larger and thicker than the standard issue version, it provides more crunch and holds more syrup in each bite so it’s even more over the top, if such a thing is possible. This is gujiya (you might see gujia), a classic Holi sweet, half-moon shaped and similar to a deep-fried samosa. 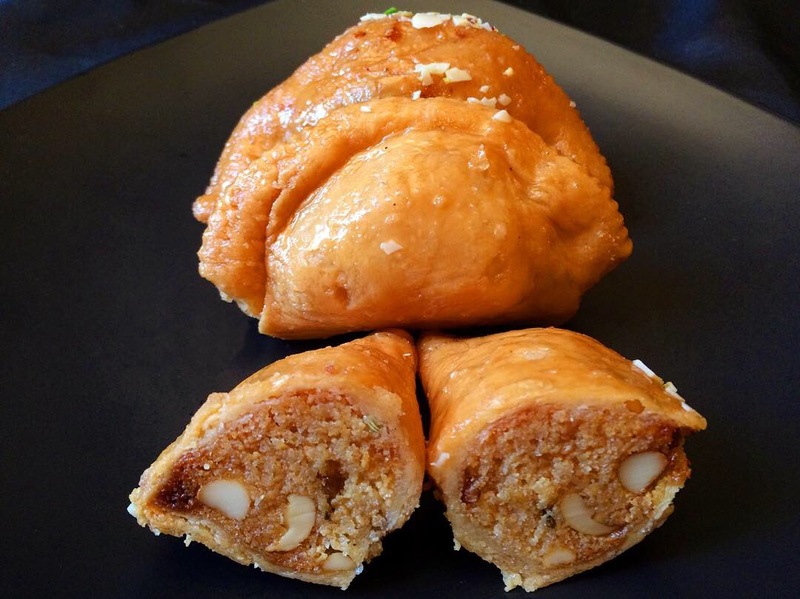 Crunchy outside and soft within, it’s filled with sweetened khoa (milk solids), ground nuts, grated coconut, whole fruits and nuts (raisins and cashews in this one), cumin seeds, and a bit of suji (semolina) for texture. These Holi day treats came from Maharaja Sweets, 73-10 37th Ave, Jackson Heights, Queens. Holi Mubarak! Have a blessed Holi! The story of Purim memorializes the time in ancient Jewish history when Haman, royal vizier to King Ahasuerus of Persia, had been plotting to exterminate all the Jews in the empire. His plan was thwarted by Mordecai and Queen Esther, his adopted daughter, and the deliverance is one of joyful celebration, steeped in traditional ceremonies and festivities. Purim begins tonight at sundown and concludes tomorrow evening, and among the many icons of the holiday, one of the most renowned is the hamantasch, literally “Haman’s pocket”. 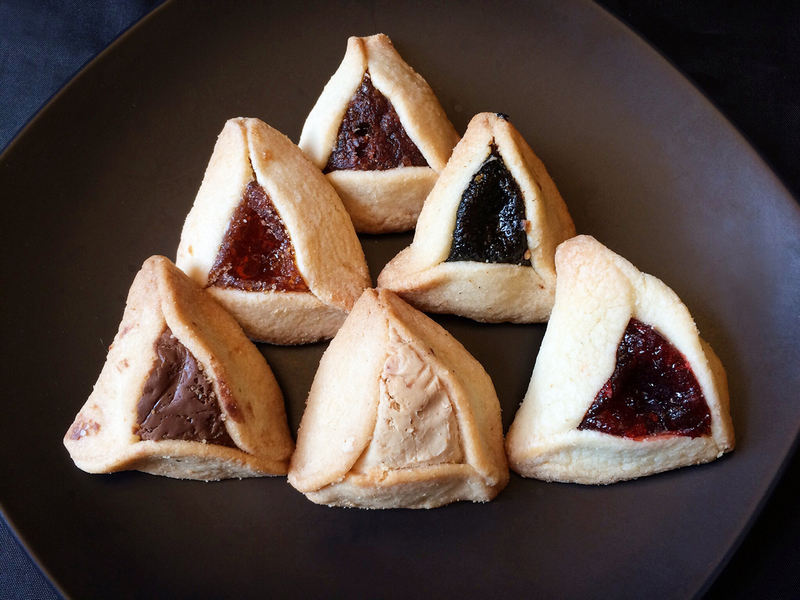 Hamantaschen are delicious triangular baked pastries conventionally filled with thick prune jam (lekvar) or sweet ground poppy seeds (muhn) but these days creative cooking prevails and fillings of apricot, fig, chocolate, halvah, raspberry and more are not uncommon and take their place beside their predecessors. These fine examples came from Queens Kosher Pita & Bakery, 6838 Main St in Flushing. An equal opportunity celebrant, I’m always keen to learn about traditional foods that are associated with religious holidays. Currently, we’re in the forty day period of Lent that begins with Ash Wednesday and ends with Holy Week, ultimately culminating in Easter Sunday. 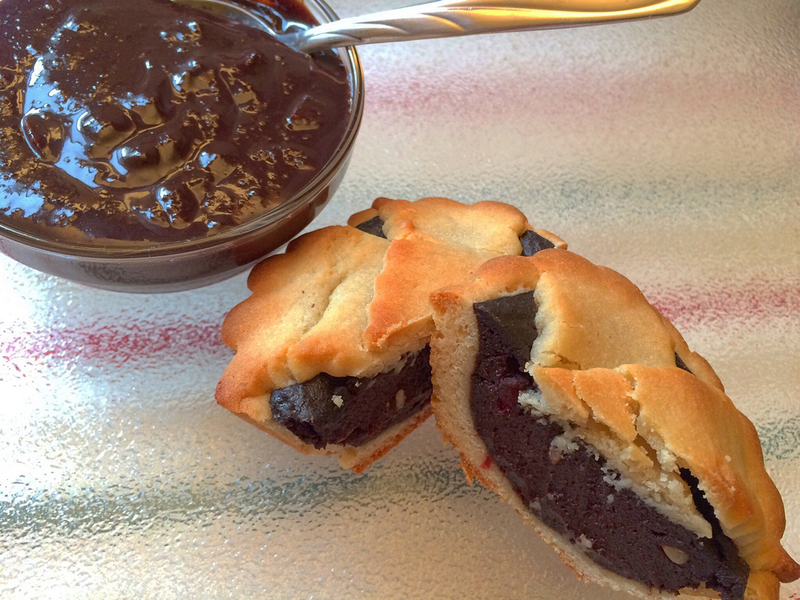 In southern Italy, Lent brings with it an unusual delicacy called Sanguinaccio Dolce, a sweet (“dolce”) dessert pudding made with pig’s blood (“sangue”). 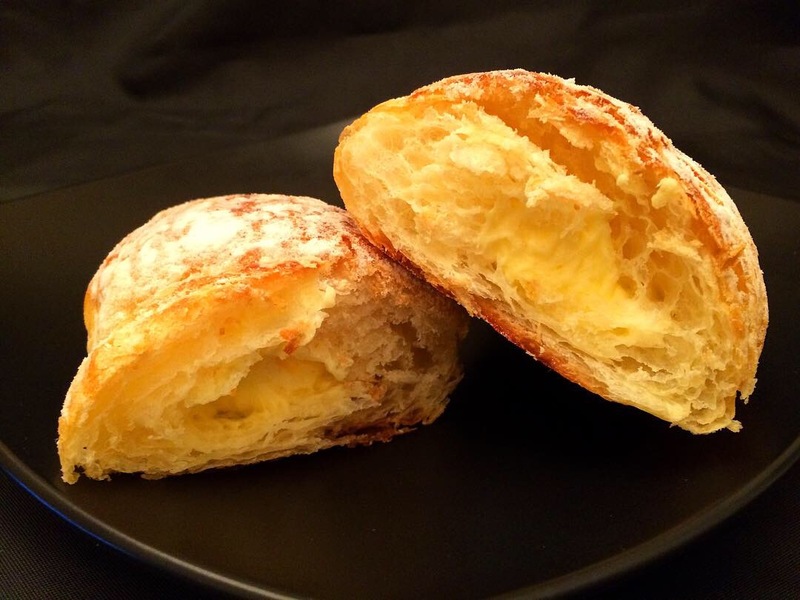 Now don’t go running off: if you follow me, you know that I recently wrote a piece for Edible Queens suggesting that durian pizza is the gateway drug for durian, the much maligned tropical fruit. I propose that sanguinaccio dolce fulfills the same role for food crafted with blood as an ingredient. Numerous cultures are at home with it – blood rice cakes in China, blood pancakes in Sweden, dinuguan in the Philippines, and sausages in Great Britain and Ireland, morcilla in Spanish speaking countries worldwide, boudin in France, and so many more in Northern and Eastern Europe. Pretty much everywhere actually. And you also know that I only recommend truly tasty food; I have never been one to embrace the sensationalism of “Look what gross thing I just ate!” No. This is genuinely delicious. The rich, dense, dark chocolate pudding carries notes of cinnamon and bits of candied orange peel, pine nuts and sliced almonds. There is no hint of minerally blood flavor. It’s often served with savoiardi, crisp ladyfingers, but a spoon will suffice. The pasticciotto sports a tender shortbread crust with a kiss of lemon and is filled with sanguinaccio. If you don’t want to travel to Naples in order to sample this treat, we are indeed blessed to have our own Little Italy in the Bronx. These two examples came from Morrone Pastry Shop at 2349 Arthur Ave in Belmont. They still have them as of this writing. If, like me, you appreciate the concept of snout-to-tail cooking and decry food waste, you should look into this. But if you just want to sample the richest, most delicious Italian dark chocolate pudding you’ve ever tasted, you need to give this a chance. Unless of course you just don’t like chocolate pudding at all, in which case, move along, nothing to eat here. She singled out the Vanilla Cream Cornet (the katakana クリームコロネ on the sign reads “cream coronet”) which proved to be great: the dough was crisper outside and airier inside than I expected, and custard filling in Japanese baked goods is sometimes less rich than their European counterparts, but this was perfection. Another familiar treat in Japanese bakeries is Melon Pan (メロンパン), sometimes plain but adorned here with chocolate bits that break the monotony (the photo may be a little deceiving, there’s no filling inside). With a crispy thin crust and a yielding interior, this sweet bread made a righteous breakfast the following morning. Note that no melons are harmed in the making of melon pan; the name merely refers to its appearance, a bit like a cantaloupe. Incidentally, the word “pan” (bread) made its way into Japanese via Portuguese missionaries. 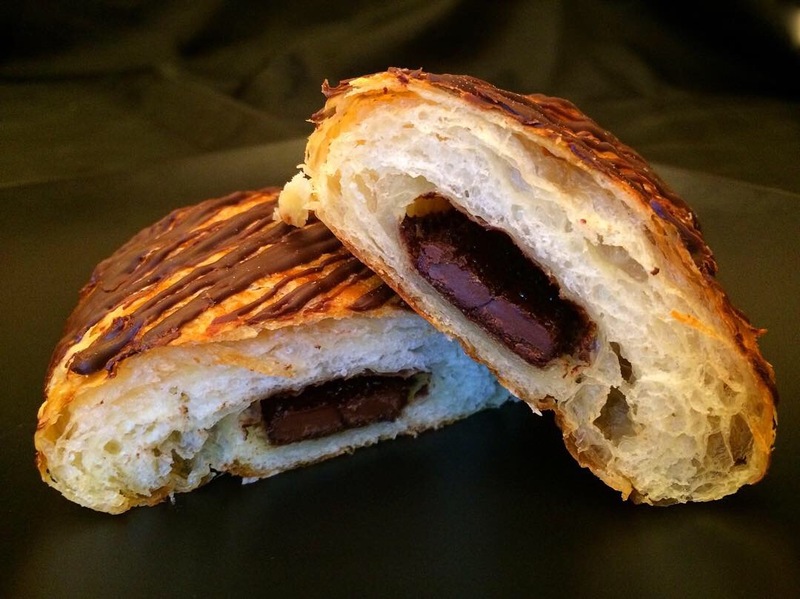 Their rendition of pain au chocolat, choco croissant (チョコクロワッサン) was satisfying as well. Hamada-ya also sells savory sandwiches like fried fish and egg, tonkatsu (pork cutlet) and tuna, and goodies that seem to straddle the sweet/savory fence like cheddar cheese curry donut. Next time! Exploring ethnic neighborhoods with likeminded foodnerd friends is pretty much my favorite pastime. On a delightful crawl through Jersey City, NJ, we stopped along the way at Rajbhog Sweets, 812 Newark Ave. We were all familiar with their outpost in Jackson Heights, Queens, but this venue appeared to offer a slightly different selection of mithai, chaats, and snacks so I was intrigued. 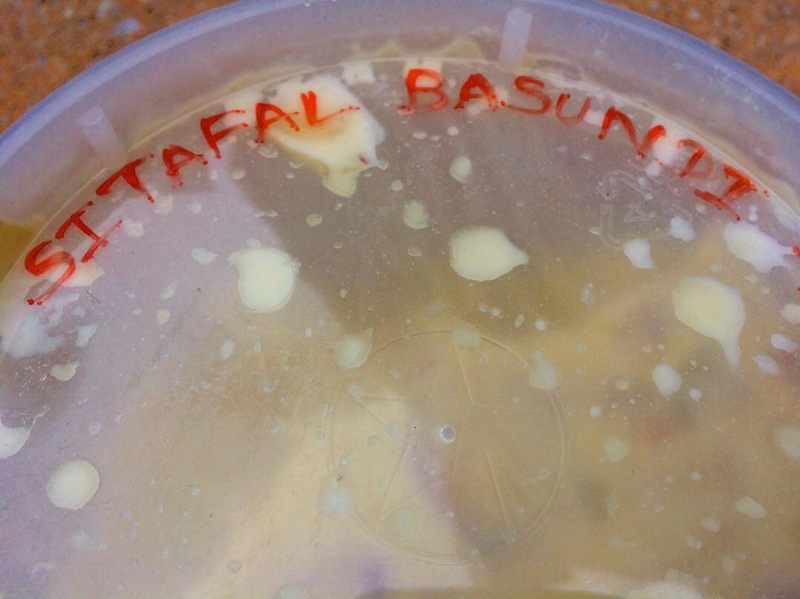 Peering into one of the freezer cases, I spotted a plastic container unceremoniously hand labeled “Sitafal Basundi” (second photo). Sitafal is the Hindi word for custard apple, a luscious tropical fruit that’s available in season at ethnic markets and sidewalk fruit stands if you know where to go (hint 😉). Basundi is a rich, creamy dessert, particularly popular in western India, that can be served warm or chilled. 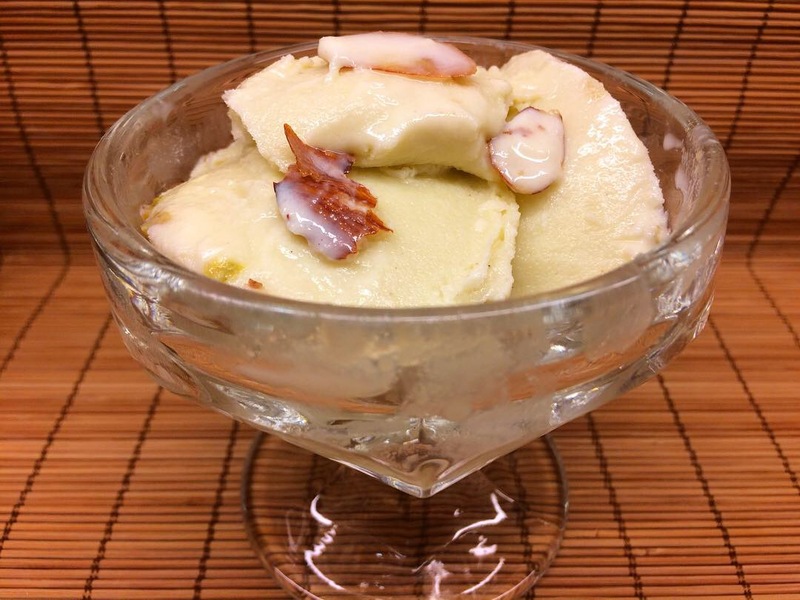 Made from long cooked cream, whole milk or sweetened condensed milk plus nuts, fruits and spices like cardamom and saffron, one could think of it as kulfi semifreddo. Being a fan of Indian sweets of every fashion, I’m rather partial to it and this version was delicious. So many more wonderful places along that strip, I need to return soon. Who’s coming with me?